Back when Jennifer Connelly was really attractive—in the baby-fat years, before she looked like a cast reject from Schindler’s List—I was obsessed with watching anything in which she appeared; not for any good reasons, understand, but simply because I thought she was hotter than sin (it wasn’t until I grew out of my teen years that I discovered how solid an actress she really is). The movie that made me fall in love with her was called Career Opportunities. It wasn’t very good, and Connelly hadn’t matured past the Megan Fox stage of her acting career; but what stood out was Frank Whaley’s performance as Jim Dodge, a good-hearted, fast-talking liar. Career Opportunities began as a character study of a small-town loser with big dreams and a bigger mouth, and ended as an ad for Target stores disguised as a wacky heist picture. I’ve forgotten a lot of that movie’s silliness, but I’ll always remember Jim Dodge and his fabled trip to Paris on an F-14. Yes, this is a review of Steven Soderbergh’s The Informant!, starring Matt Damon. Damon plays the real-life Mark Whitacre, a former biochemist from Central Illinois who became a division president at Archer Daniels Midland in the early ‘nineties. As the film opens, Whitacre learns of an industrial sabotage plot at ADM and tells his bosses that there may be a mole at the company. The FBI is brought in, and things spiral out of control. That is all I’m going to say about the plot of The Informant! because it absolutely should not be ruined. This is one of the year’s best movies. It’s the rare comedy that engages the mind and simultaneously elicits gut-laughs from anyone paying attention. And it is very important that you pay attention. I was honestly lost for about the first twenty minutes of the film because the dialogue and subject matter are so dense as to be almost impenetrable; I felt at a disadvantage not having followed the Whitacre story in the real world. Fortunately, the confusion was not due to a deficiency on my part, but to a brilliant, complex web of obfuscation by screenwriter Scott Z. Burns. By film’s end, everything made perfect sense, and like half the characters in the movie, I felt like I’d been made a fool. Steven Soderbergh took a risk with this movie—one that paid off, by the looks of the number-two opening weekend spot. Everything is off-kilter, from the slide-whistle zaniness of Marvin Hamlisch’s score to the weird 1980’s cinematography, to the brilliant decision to populate seventy percent of the supporting cast with comedians, all playing completely serious roles (Patton Oswalt and The Smothers Brothers have never enjoyed this much gravitas). The topper, though, is Damon’s narration. The actor packed on some pounds to play a comfy-living Midwesterner, but the spark of his performance comes from the Jack Handey-style musings that play over mundane scenes. Whether he’s driving his car or sitting in a meeting with lawyers, these monologues convey deeper levels hidden by Whitacre’s overeager, good-natured demeanor. They’re funny, but tinged with pathos, and when the movie’s over, you’ll understand why. 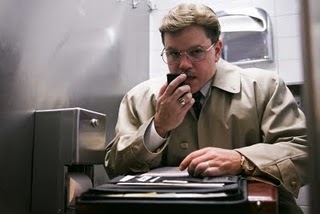 The genius of The Informant! is the way in which the story evolves from the sweet man-vs.-corporation tale sold by the trailer into a savage portrait of greed and corrupted values; it keeps changing and twisting until, ultimately, we’re left with a dark farce whose moral we never saw coming. I haven’t been this surprised by a film’s resolution since The Usual Suspects; it’s that good. Which brings me back to Career Opportunities. Mark Whitacre is like the flesh-and-blood version of Jim Dodge. Both are optimists hobbled by a terminal lack of coolness. Both have outsized imaginations and a penchant for storytelling that lands them in big trouble. But only Whitacre’s movie is consistently real and entertaining from beginning to end; since I was a teenager, I’ve wondered what would’ve happened had Career Opportunities not abandoned its truly interesting parts in favor of romance and shtick. In a strange way, The Informant! is the answer I’ve been waiting for, a movie that takes its premise to the nth degree and takes us down all the hilarious, horrifying avenues it implies.